We also include above a photograph of the comet Hale-Bopp, enhanced to emphasize the rich filamentation of the comet tail. Electric Universe theorists identify comets as plasma discharge phenomena—negatively charged objects moving rapidly through the electric field of the Sun. In periods of instability and upheaval, planets and moons were subjected to intense electrical arcing. Though this idea is certainly “off the map” of conventional theory, plasma cosmologists, together with growing numbers of “Electric Universe” advocates, argue that the actual history of the solar system does not resemble the popular textbook summary. Stars and planets are born in electrical events more powerful than anything gravity alone can create. As Hannes Alfvén, the father of plasma cosmology, stated to his colleagues: our local gravitational system is the “ashes” of a prior electrical system. The point is well illustrated by the close-up photo of the stupendous “volcano” Olympus Mons on Mars. 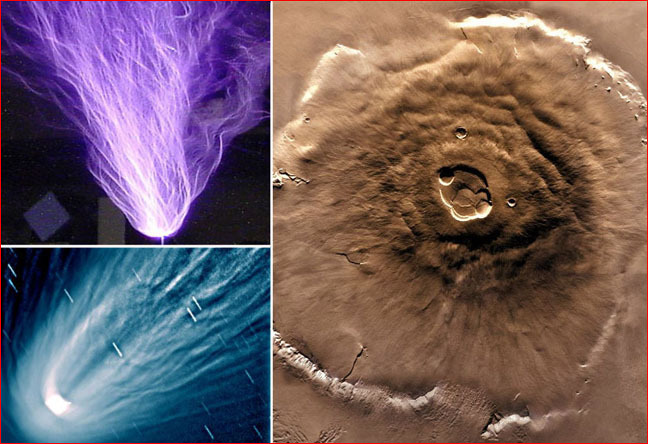 In the electric model, Olympus Mons and other giant mounds on the Tharsis bulge are discharge “blisters” typical of those created by an electric discharge on a positively charged surface, or anode. The picture suggests an extended event on Mars in which electrons streamed in to the top of a huge mound that had been raised from the surface by the electric force. As the discharge event excavated a series of flat-bottomed craters on the summit, the summit became a regional focal point of negative charge within a larger positively charged surface. To achieve surface equilibrium, then, secondary discharging occurred between the "cauldron" of Olympus Mons and the surrounding region in a way analogous to the discharge of a negatively charged comet nucleus as it enters the positive region of the Sun's electric field. Thus, the finely filamented radiating "mane" is comparable to what we would see if we looked up the axis of John Dyer's lab discharge or the Hale-Bopp discharge shown above. Significantly, a virtually identical finely filamented mane is seen at the summit of Ascraeus Mons in the same region of Mars. In an electrical interpretation, charge redistribution will account for a repeated feature that otherwise has no coherent explanation.